First cataloged by Edmond Halley 1677. The variability was noted 1827 by Burchell. Eta Carinae is one of the most remarkable stars in the heavens. This star was first cataloged by Edmond Halley in 1677, as a star of fourth magnitude. Since, its brightness has varied in a most remarkable way: In 1730, its brightness reached mag 2, and again fell to mag 4 in about 1782. It brightened again about 1801 and faded back to 4th magnitude in 1811. In 1820, Eta began to brighten steadily, reaching 2nd magnitude in 1822 and 1st mag in 1827. After this first preliminary maximum, the star faded back to mag 2 for about 5 years, then rose again to about mag 0. After a further slight decline, Eta's brightness incresed once more and reached its maximal brilliance of nearly -1.0 in April 1843, when it outshone all stars in the sky but Sirius. After this brilliant show, the star slowly faded continuously, and became invisible in 1868. Interrupted by two minor outbursts around 1870 and 1889, Eta Carinae faded to about 8th magnitude around 1900, where it remained until 1941. At that time, the star began to brighten again, and reached 7th magnitude about 1953. Slowly and steadily, Eta Carinae became brighter until about 6th magnitude in the early 1990s - the star reached naked-eye visibility again at that time. Then in 1998-99, the star suddenly brightened by about a factor two. This behavior is not fully understood at this time (early 2000), and it seems hard to predict how this remarcable variable will develop in the future. Eta Carinae is one of the most massive stars in the universe, with probably more than 100 solar masses (Jeff Hester of the ASU, who made this HST image, has estimated 150 times the mass of our sun, Robert Zimmermann gives 120 solar masses in his article in Astronomy, Feb. 2000 issue). It is about 4 million times brighter than our local star, making it also one of the most luminous stars known. Eta Carinae radiates 99 % of its luminosity in the infrared part of the spectrum, where it is the brightest object in the sky at 10-20 microns wavelength. As such massive stars have a comparatively short expected lifetime of roughly 1 million years, Eta Carinae must have formed recently in the cosmic timescale; it is actually situated in the heavily star forming nebula NGC 3372, called the Great Carina Nebula, or the Eta Carinae Nebula. It will probably end its life in a supernova explosion within the next few 100,000 years (some astronomers speculate that this will occur even sooner). 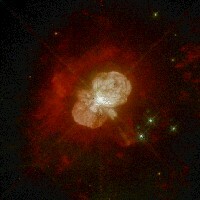 Because of its high mass, Eta Carinae is highly unstable, and prone to violent outbursts. According to the current theory of stellar structure and evolution, this instability is caused by the fact that its high mass causes an extremely high luminosity. This leads to a high radiation presure at the star's "surface", which blows significant portions of the star's outlayers off into space, in a slow but violent eruption. Our image shows the nebula formed by the ejected material. The last of these outbursts occurred between 1835 and 1855 and peaked in 1843, when despite its distance (7,500 to 10,000 light years away) Eta Carinae briefly became the second brightest star in the sky with an apparent magnitude -1. The picture in this page is a combination of three different images taken in red, green, and blue light. The ghostly red outer glow surrounding the star is composed of the very fastest moving of the material which was ejected during the last century's outburst. This material, much of which is moving more than two million miles per hour, is largely composed of nitrogen and other elements formed in the interior of the massive star, and subsequently ejected into interstellar space. The bright blue-white nebulosity closer in to the star also consists of ejected stellar material. Unlike the outer nebulosity, this material is very dusty and reflects starlight. The new data show that this structure consists of two lobes of material, one of which (lower left) is moving toward us and the other of which (upper right) is moving away. The knots of ejected material have sizes comparable to that of our solar system. The total mass of the ejecta from the last outburst is estimated to be two to three solar masses. The rapidly moving ejected gas shows up in spectra of Eta Carinae by peculiarly shifted spectral lines, forming the so-called P Cygni profiles (named after P Cygni, one of the other few star of same type known in the Milky Way). Our image is one of the first taken with the refurbished Hubble Space Telescope (HST) in January, 1994, with the new Wide Field Planetary Camera (WFPC) 2, which had been mounted by the crew of the STS-61 Space Shuttle mission (look at the press release for this image, as presented at SEDS). Newer HST pictures (taken in September 1995) have revealed even more detail, and significant changes with time.